Andy Roddick and Marat Safin, travelling down distinctly different roads today, headed for an explosive third-round collision at the Australian Open. Andy Roddick of the US celebrates after winning his match against Marc Gicquel of France at the Australian Open in Melbourne on Wednesday. Amelie Mauresmo crushed Olga Poutchkova 6-2, 6-2 to reach the Australian Open third round today after a bizarre incident at the end of the first set brought into question the use of instant replay technology. Australian one-day cricket specialist Michael Bevan today announced his retirement from the game after failing to make it to the World Cup squad. A key member of the World Cup winning team in 1999 and 2003, Bevan said injuries and exclusion from the 30-member World Cup probables list had prompted the decision. World champions Netherlands blanked hosts Argentina 3-0 to register their third straight win in the BDO Champions Trophy hockey tournament for women here. Chandigarh Dynamos continued their poor run as in another match in which goals were at a premium, Chennai Veerans edged them out by a solitary goal in the BSNL Professional Hockey League (PHL) at the astro turf stadium here today. The Lahore XI team entered the quarterfinals of the All-India S. Balwant Singh Kapur Memorial Hockey Tournament after winning their first league match 5-2 against Dashmesh Government Senior Secondary School, Jarkhar, at Surjit Hockey Stadium here today. 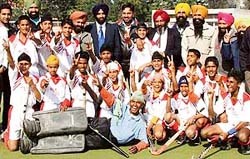 In a keenly contested final, Mata Sahib Kaur Hockey Academy, Jarkhar, edged out Grewal Academy, Kila Raipur, to emerge champions in the Ist Punjab Hockey League B for boys (u-14) organised by the Punjab Sports Department which concluded at the Prithipal Singh Astroturf Stadium on the Punjab Agricultural University campus here today. Churchill Brothers, Goa, and former champions JCT battled to a goal-less draw in the third round of the 11th National Football League at Guru Nanak Stadium here today. Although JCT enjoyed a slight edge over their rivals in the gruelling encounter, some fine saves by Churchill goalkeeper Vinay Singh denied them an opportunity to log full points. With today's draw, JCT now have four points while Churchill Brothers' tally has gone up to five. The American sixth seed came out firing against Frenchman Marc Gicquel and accelerated to a 6-3, 7-6, 6-4 win. 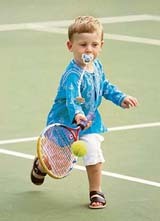 Safin, champion in 2005, again chose a more winding route. He made things difficult for himself as he was stretched to five sets for a second successive match before steering past Israeli qualifier Dudi Sela 6-3, 5-7, 4-6, 7-6, 6-0. The Russian has now won 26 of 37 five-set matches in his career but cannot afford such lapses against a man who owns the fastest serve in the game. 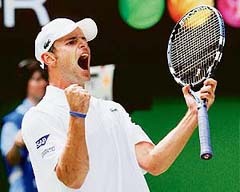 “We’re both better than a third round match-up against each other but that’s the way it shakes out,” said Roddick. Champions Roger Federer and Amelie Mauresmo put tennis back under the spotlight at Melbourne Park after the opening days’ troubles. However, Marcos Baghdatis failed to repeat his heroics of last year when he was beaten 7-6, 6-2, 2-6, 6-0 by Frenchman Gael Monfils in the second round. The 11th-seeded Cypriot, whose fairytale run to the final in 2006 ended in defeat at the hands of Roger Federer, found the power of the gangling 20-year-old too much to handle and went down in two hours and 37 minutes on Rod Laver Arena. Federer set the agenda as his pursuit of a 10th Grand Slam title gathered pace with a 6-2, 6-3, 6-2 win over Swedish doubles exponent Jonas Bjorkman. Mauresmo enjoyed an even more one-sided 6-2, 6-2 success against Russian teenager Olga Poutchkova, although one incident brought into question the validity of the instant replay technology being used at the event for the first time. Federer, meanwhile, sealed victory in 95 minutes and extended his perfect record to 5-0 against Bjorkman, who has never won a set off the Swiss maestro. Up next for Federer is 25th seed and U.S. Open semi-finalist Mikhail Youzhny, although one player the Swiss great will not be facing is Cypriot Marcos Baghdatis. The enigmatic 11th seed, whose fairytale run to last year’s final was ended by Federer, lost in four sets to Gael Monfils, who now meets fellow 20-year-old Frenchman Richard Gasquet. Twice former champion Serena Williams staggered and then powered her way to a 7-6, 6-2 victory. With fifth seed Nadia Petrova up next for the American, she will not want her mind wandering as it did today. Russians Svetlana Kuznetsova and Petrova seemed to be in a hurry to get out of the humid conditions after both ended up on the casualty list at last week’s Sydney International. Third seed Kuznetsova romped past Australian wildcard Monique Adamczak 6-2, 6-1 and No. 5 Petrova was equally emphatic in her 6-1, 6-2 win over Argentine Gisela Dulko. Seventh seed Elena Dementieva also progressed. The Russians were joined in the third round by in-form Serbian 11th seed Jelena Jankovic, a 6-2, 6-2 winner over Virginia Ruano Pascual of Spain. With Tuesday’s draining conditions having caused the suspension of many matches, seeds Patty Schnyder, Dinara Safina and Daniela Hantuchova were all relieved to win their delayed first-round matches in straight sets. The second seed looked below her best and was a break down at 2-1 in the second set, but recovered to book her place in round three after 72 minutes on Rod Laver Arena. But an incident at set point in the opener reignited the debate about HawkEye, in use at the Grand Slam event for the first time, when Mauresmo challenged a call after a deep shot from the Russian teenager was called in. Mauresmo challenged the call and the television graphic on the main showpiece court showed the ball had bounced beyond the baseline, but the caption below read ‘In’, leading chair umpire Kerrilyn Cramer to ask the players to replay the point. Australian one-day cricket specialist Michael Bevan today announced his retirement from the game after failing to make it to the World Cup squad. A key member of the World Cup winning team in 1999 and 2003, Bevan said injuries and exclusion from the 30-member World Cup probables list had prompted the decision. “I felt that I just could not play to the standard that I would like and I do not think that I could have played to the standard that my team-mates would have liked,” the 36-year-old batsman said. Once regarded as the best limited-overs batsman in the world, Bevan admitted he was hoping for a berth in the Australian squad, which would vie for a hat-trick of triumphs at the cricketing extravaganza in the Caribbean in March-April. “The World Cup was something that I always wanted to be a part of and I still felt I was a good enough player to be a part of the team,” said Bevan. “But it got to the stage where injuries and pain were holding back my motivation, and it got to the stage where I was finding it hard to get up for matches and that was probably a pretty clear indication that it was time to move on,” said the player who has had to cope up with hip and knee problems. Bevan made his ODI debut in 1994 and played in 232 matches, scoring 6912 runs at an average of 53.58. He also scored six centuries. Bevan earned the reputation of a perfect finisher in the shorter version of the game as he won many close matches for the Aussies with his temperament while coming in to bat at number 6. But he was dropped from the side in 2004 as selectors looked to pass over the baton to the new generation. “I have pretty much achieved what I wanted to achieve and I’ve been glad that I’ve had the opportunity to play cricket for a living,” Bevan said. Success at the Test level eluded Bevan and he wore the baggy green in just 18 matches, averaging 29. He represented South Australia, New South Wales and lately Tasmania in domestic cricket and ended his career with 19,147 first-class runs at 57.32 with 68 centuries. In other matches, Spain held Australia 2-2, while Germany edged out Japan 1-0. In what was the 250th match in women’s Champions Trophy history, the Argentina-Netherlands match, the world champions underlined their supremacy with a resounding display of compact hockey. The Netherlands got on the scoreboard as early as the 12th minute when Fatima Moreira de Melo deflected in from a penalty corner hit and the score remained unchanged at half time. The Dutch eves did not allow the hosts to settle when play resumed and Kim Lammers was bang on target in the 38th minute and the in-form Dutch completed her brace in the 56th minute to seal the fate of the game. Albert Kasas got the lone goal for Chennai Veerans. The win boosted their tally to six points from four matches. Dynamos have just two, having lost all. The Dynamos, however had only themselves to blame as they forced four penalty corners but failed to convert even one. Chennai Veerans wasted two penalty corners. Yesterday, Orissa Steelers scraped past Hyderabad Sultans by a solitary Dilip Tirkey goal, but the second phase match in the 2007 Premier Hockey League failed to rise to any high standards. Even with six foreign stars in two teams, the match at the Mayor Radhakrishna Stadium was eventful only in the sense that three players received yellow cards for 'unfair play.' With this win, Orissa Steelers have tallied eight points from four matches, while Hyderabad Sultans remain at three from as many games. Orissa Steelers scraped past Hyderabad Sultans by a solitary Dilip Tirkey goal yesterday, but the second phase match in the 2007 Premier Hockey League failed to rise to any high standards. India captain Dilip Tirkey made good use of his team's third penalty corner in the 69th minute. 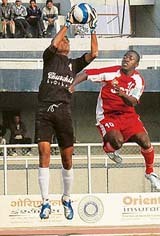 Birendra Lakra pushed the ball. Jitender Saroha could not get a good look at the goal and pushed back to Bimal Lakra, who relayed the ball to Tirkey on the left. Tirkey darted in and sounded the boards to seal the winner. Shahbaz Ali of Lahore XI scored the first hat-trick of the tournament by striking the board for the second, third and fourth goals for the team. Lahore XI captain Zeesham Ali scored the first goal in the sixth minute. Tanveer Singh of Jarkhar scored an equaliser in the 11th minute. Then Shahbaz took the lead to 4-1 scoring two filed goals and one through a penalty stroke in the 42nd minute. Prabjeet Singh of Jarkhar turned the score 2-4 but Mohammad Umer Bhutta struck in the 61st minute taking the scoreboard to 5-2. Guru Harkrishan Public School, Delhi, also entered the quarterfinals defeating Government Senior Secondary School, PAU, Ludhiana, 5-0. Lyallpur Khalsa School, Jalandhar, and Government Senior Secondary School, Maqsudan, too have qualified for the quarterfinals. In another match, Government High School, Chandigarh, won the match 5-0 defeating Government Senior Secondary School, Jharsa. The issue was resolved in a shoot out as both the teams were tied 1-1 at the end of the stipulated period. Kila Raipur boys surged ahead in the 17th minute through a penalty corner conversion by Navjot Singh. Amritpal Singh of Jarkhar outfit equalised in the 53rd minute. Earlier, in the match for the Hardline Cup, Khusropur Academy, Jalandhar, prevailed over Amloh Academy 1-0 to secure the third spot. Mr Ashok Kumar Gupta, Deputy Commissioner, Ludhiana gave away prizes to the winners. He distributed the sports kits, tracksuits and hockey sticks to the participants. Nigerian striker and Churchill Brothers' skipper Odafa Onyeka Okolie, who was expected to play a dominant role, did show flashes of brilliance intermittently. A power-packed free kick from the centre circle by Okolie was punched away in the nick of time by the JCT goalie Karanjit Singh, who dived full length to avert danger. The lanky Nigerian again held the spotlight at the stroke of half time, though for all the wrong reasons. A rough tackle on the right flank saw Okolie kneeling on the ground, writhing in pain even as the game continued. Seemingly upset over the referee's attitude, Okolie vent his anger at referee Subrata Das, who pulled out the yellow card to discipline him, leading to further arguments. But by that time the damage had been done. It being the second yellow card booking, Okolie will now miss Churchill Brothers' next match against East Bengal. "It's a conspiracy," alleged Mr Churchill Alemao, the club supremo and former Goa Chief Minister. "They wanted Okolie out of action in our match against East Bengal and have succeeded in their designs," he fumed. The match, on the whole, witnessed an equal share of exchanges. JCT were on the offensive in the opening stages with Rennedy Singh's curling free kick from 30 yards being parried over by the goalie for a corner. Again Rennedy's powerful shot off a back pass by striker Sunil Chhetri went waste thanks to goalie Vinay's alertness. A glancing header by Chhetri off a free kick also proved to be a close miss. The JCT citadel nearly fell in the 18th minute when Okolie moved in menacingly before putting Chandam Singh in possession. The latter's well-directed shot saw the laborious Baldeep Singh making a goal-line save. Shortly before half time, JCT made a couple of close calls through Edeh Chidi and Sunil Chhetri. On one occasion Chhetri back-heeled a Chidi lob but narrowly missed the mark. A throw-in by wing back Daljit was followed by Edeh Chidi's well-directed header but the ball sailed over. Later, Baldeep's volley off a flag kick by Rennedy Singh saw Roque Barreto making a goal-line save. The second half also witnessed a ding-dong battle. After Robert Lalthlamvana's unsuccessful attempt, JCT's Edeh Chidi latched on to the ball following a counter attack but his powerful shot from inside the box again brought out the best in Vinay Singh under Churchill Brothers' bar. Midway into the second session, JCT striker Sunil Chhetri's quick pass to the onrushing Chidi only saw the latter ballooning the ball over the bar from hand-shaking distance. Edeh Chidi had another golden chance towards the end when he swung on his heel inside the box after dodging a defender and with a clear view of the goal, unleashed an angular shot. However, to his dismay, Vinay proved equal to the task and effected an acrobatic save.